Jellyfish Eyes Returns to America with a Nationwide tour!! 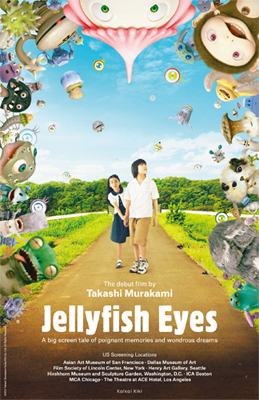 The Jellyfish Eyes Theatrical Premiere Is Now Confirmed for April 2013! We are pleased to announce that from May 1 ~ June 5 2014, Jellyfish Eyes will tour several venues in the United States. gallery Blum & Poe and are now ready to bring Jellyfish Eyes back to the US. The tour will take place over the course of one month and include stops at major art institutions in Dallas, Boston, Seattle, Washington DC, Chicago, LA, NY, and San Francisco. Our second screening in LA will be held at what is known as a veritable temple of art, The Ace Hotel. The screening in New York will likewise happen at that famous treasure of the entertainment world, Lincoln Center. Takashi Murakami himself will be present at several stops on the tour and will be participating in live talks with the museum/theater staff. We will continue to update this page with the latest information, so please keep an eye out.